Use this document to transfer one party’s rights and obligations under a service contract to another party. This is a simple yet comprehensive agreement that can be used to novate any service contract with only minimal editing. It ensures continuity of service when the party receiving the service changes. For the purposes of providing a working example, this document has been edited to allow the transfer of a website hosting service agreement between the customers of an Internet service provider (ISP). The consent of all three parties - the transferee, the transferor and the other contracting party - is required to effect the novation. Unless you specifically require the consent of the other contracting party (perhaps because your contract has a non-assignment clause), our assignment agreement may be an even simpler way of transferring your contract to someone else. 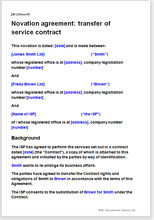 This document can be used to transfer any service contract to another party. On the sale of an asset in the process of being produced or amended. The seller of the business, who wishes to make a sale as easy and therefore as attractive to a prospective buyer as possible.